Double orifice mitral valve (DOMV) is an uncommon anomaly that was first described by Greenfield in 1876. Since that time, more than 200 cases have been reported. This anomaly is characterized by a mitral valve with a single fibrous annulus with 2 orifices that open into the left ventricle (LV), as depicted in the image below. Two-dimensional echocardiogram (apical view) in a patient with duplicate mitral valve. Two mitral valves can be seen opening into the left ventricle. Each valve has a separate annulus, and a separate set of mitral valve leaflets and subvalvar apparatus. Subvalvular structures, especially the tensor apparatus, invariably show various degrees of abnormality. Although double orifice mitral valve may allow normal blood flow between the left atrium and LV, it can substantially obstruct mitral valve inflow or produce mitral valve incompetence. Recognition of double orifice mitral valve and awareness of the anatomic variations are important to achieve good therapeutic results. Treatment is only necessary if significant mitral stenosis (MS) or mitral regurgitation (MR) is present. The normal mitral valve consists of a large, central orifice located between a large sail-like anterior leaflet and a small, C-shaped posterior leaflet. In double orifice mitral valve, abnormal tissue divides the orifice into 2 parts. In about 15% of patients with double orifice mitral valve, a central bridge of fibrous or abnormal leaflet tissue connects the 2 leaflets of the mitral valve, dividing the orifice into medial and lateral parts. These 2 openings may be equal or unequal, and the papillary muscles are usually normal, with chordae surrounding each orifice inserting into one papillary muscle. In this type of double orifice mitral valve, dilatation of the posteromedial orifice is feasible by means of balloon valvuloplasty. In a postmortem series of 27 cases of double orifice mitral valve, Bano-Rodrigo et al concluded that 44% had an intact AV septum and 56% had an AV septal defect; 52% had mitral stenosis or mitral regurgitation. Double orifice mitral valve was always associated with an anomaly of the subvalvular apparatus because, by definition, a separate tensor apparatus is attached to each orifice. Abnormal structures, including large bridging tissue, bulky abnormal leaflets, fused chordae, or abnormal papillary muscles reduce the effective area of the valve. Abnormalities in the leaflets include thickening, fusion, perforations, restricted movements, and ruptured chordae with flail cusps. Such valves can result in clinically significant degrees of mitral incompetence. In another published clinical series of 18 patients with double orifice mitral valve and intact AV septum, Das et al found that double orifice mitral valve was most commonly associated with left sided obstructed lesions in 39% of the cases and with ventricular septal defects (VSDs) in 17% of the cases. In contrast to the above postmortem study, only 11% had significant mitral stenosis or mitral regurgitation. Higher incidence of mitral stenosis and mitral regurgitation noted in the postmortem study may be related to the selective bias because it was performed at a tertiary care specialized center. Other associated lesions include VSD, coarctation of the aorta, interrupted aortic arch, subaortic stenosis, patent ductus arteriosus, and primum ASD. Double orifice mitral valve has also been reported in trisomy 21, de Lange syndrome, Astrom syndrome, Kabuki syndrome, and isovaleric academia. In a published clinical series of 46 children with double orifice mitral valve, Zalzstein et al reported that mitral regurgitation was most frequent association and was detected by color Doppler in 43% of the patients. Double orifice mitral valve with normal flow was seen in 37% of the patients, and mitral stenosis was detected in 13% of the patients. Mitral stenosis and regurgitation were found together in 6.5% of the patients. However, only 16% of the patients had severe enough lesions to require surgical intervention. A reduction in the total area of the mitral valve orifice obstructs its inflow. When mitral stenosis is clinically significant, a diastolic pressure difference builds up between the left atrium and the LV. The rise in left atrial and pulmonary venous pressure leads to exudation of fluid into the interstitium of the lung and increased pulmonary stiffness (the main cause of breathlessness). In severe cases, frank pulmonary edema develops. Persistent pulmonary venous hypertension leads to pulmonary arterial hypertension, a rise in pulmonary vascular resistance and eventually, failure of the right ventricle (RV) with tricuspid regurgitation. About 25% of patients with double orifice mitral valve present with mitral regurgitation as the dominant hemodynamic abnormality, especially when it is associated with an atrioventricular canal defect. Similar to mitral stenosis, mitral regurgitation causes left atrial and pulmonary venous hypertension. Clinical effects depend on the severity and duration of mitral regurgitation. LV outflow obstruction from associated subaortic stenosis or coarctation can aggravate the mitral regurgitation. With increasing mitral regurgitation, cardiac output is maintained by increasing LV diastolic volume and hypertrophy. In chronic mitral regurgitation, LV function deteriorates, leading to further worsening of pulmonary venous congestion, pulmonary hypertension, and right heart failure. Ventricular dysfunction secondary to chronic dilatation is often irreversible even after the primary mitral lesion is corrected. The left atrium tends to markedly enlarge in mitral regurgitation and may compress the left bronchus. To the author's' knowledge, no data are available on the incidence of double orifice mitral valve. More than 180 cases of double orifice mitral valve are reported in the literature. Approximately 50% of all cases of double orifice mitral valve are detected during investigation of other CHDs. Greenfield WS. Double mitral valve. Trans Pathol Soc. 1876. 27:128-129. Anwar AM, McGhie JS, Meijboom FJ, Ten Cate FJ. Double orifice mitral valve by real-time three-dimensional echocardiography. Eur J Echocardiogr. 2008 Sep. 9(5):731-2. [Medline]. Bano-Rodrigo A, Van Praagh S, Trowitzsch E, Van Praagh R. Double-orifice mitral valve: a study of 27 postmortem cases with developmental, diagnostic and surgical considerations. Am J Cardiol. 1988 Jan 1. 61(1):152-60. [Medline]. Trowitzsch E, Bano-Rodrigo A, Burger BM, Colan SD, Sanders SP. Two-dimensional echocardiographic findings in double orifice mitral valve. J Am Coll Cardiol. 1985 Aug. 6(2):383-7. [Medline]. Sanchez Carlos A, Rabago P, Sokolowski M. Duplication of the tricuspid valve. Br Heart J. 1967 Nov. 29(6):943-6. [Medline]. [Full Text]. Ozeke O, Ozbakir C, Gunel EN. Double mitral valve imaging. J Am Soc Echocardiogr. 2010 Mar. 23(3):340.e1-2. [Medline]. Warnes C, Somerville J. 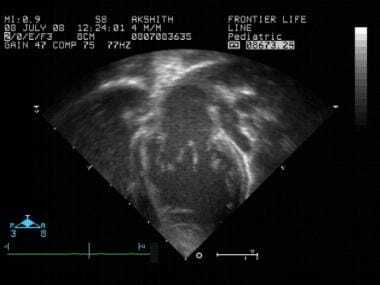 Double mitral valve orifice in atrioventricular defects. Br Heart J. 1983 Jan. 49(1):59-64. [Medline]. [Full Text]. Das BB, Pauliks LB, Knudson OA, et al. Double-orifice mitral valve with intact atrioventricular septum: an echocardiographic study with anatomic and functional considerations. J Am Soc Echocardiogr. 2005 Mar. 18(3):231-6. [Medline]. Zalzstein E, Hamilton R, Zucker N, Levitas A, Gross GJ. Presentation, natural history, and outcome in children and adolescents with double orifice mitral valve. Am J Cardiol. 2004 Apr 15. 93(8):1067-9. [Medline]. Yesilbursa D, Miller A, Nanda NC, et al. Echocardiographic diagnosis of a stenotic double orifice parachute mitral valve with a single papillary muscle. Echocardiography. 2000 May. 17(4):349-52. [Medline]. Sugiyama H, Hoshiai M, Toda T, Nakazawa S. Double-orifice mitral valve associated with noncompaction of left ventricular myocardium. Pediatr Cardiol. 2006 Nov-Dec. 27(6):746-9. [Medline]. Shiran A, Lewis BS. Acquired partially flail leaflet causing severe mitral regurgitation in a congenital double-orifice mitral valve. J Am Soc Echocardiogr. 2004 May. 17(5):478-9. [Medline]. Kim SJ, Shin ES, Lee SG. Congenital double-orifice mitral valve with mitral regurgitation due to flail leaflet in an elderly patient. Korean J Intern Med. 2005 Sep. 20(3):251-4. [Medline]. Gerber IL, Calder AL, Ruygrok PN, et al. Association of a double orifice mitral valve with a bicuspid aortic valve in an explanted heart with dilated cardiomyopathy. Heart Lung Circ. 2003. 12(3):188. [Medline]. Park IS, Yoo SJ, Kim KS, Hong CY. Tricuspid atresia associated with double-orifice mitral valve and coronary sinus septal defect. Tex Heart Inst J. 1991. 18(3):202-5. [Medline]. Abdullah M, Pearce K, Palmer N, Chenzbraun A. Double orifice mitral valve with dysplastic tricuspid valve and intact interatrial septum: a three-dimensional echocardiographic study. Eur J Echocardiogr. 2008 Jul. 9(4):598-9. [Medline]. Westendorp IC, de Bruin-Bon HA, Hrudova J. Double orifice mitral valve; a coincidental finding. Eur J Echocardiogr. 2006 Dec. 7(6):463-4. [Medline]. [Guideline] Bonow RO, Carabello BA, Chatterjee K, et al. 2008 Focused update incorporated into the ACC/AHA 2006 guidelines for the management of patients with valvular heart disease: a report of the American College of Cardiology/American Heart Association Task Force on Practice Guidelines (Writing Committee to Revise the 1998 Guidelines for the Management of Patients With Valvular Heart Disease): endorsed by the Society of Cardiovascular Anesthesiologists, Society for Cardiovascular Angiography and Interventions, and Society of Thoracic Surgeons. Circulation. 2008 Oct 7. 118(15):e523-661. [Medline]. Ito-Akabori S, Nakagawa M, Okamoto N, et al. Clinical characteristics and diagnosis of double-orifice left atrioventricular valve associated with other congenital heart disease. Heart Vessels. 2005 Nov. 20(6):286-9. [Medline]. De Castro S, Caselli S, Papetti F, Ventriglia F, Giardina A, Cavarretta E. Feasibility and clinical impact of live three-dimensional echocardiography in the management of congenital heart disease. Echocardiography. 2006 Aug. 23(7):553-61. [Medline]. Kutty S, Colen TM, Smallhorn JF. Three-dimensional echocardiography in the assessment of congenital mitral valve disease. J Am Soc Echocardiogr. 2014 Feb. 27(2):142-54. [Medline]. [Guideline] Wilson W, Taubert KA, Gewitz M, et al. Prevention of infective endocarditis: guidelines from the American Heart Association: a guideline from the American Heart Association Rheumatic Fever, Endocarditis and Kawasaki Disease Committee, Council on Cardiovascular Disease in the Young, and the Council on Clinical Cardiology, Council on Cardiovascular Surgery and Anesthesia, and the Quality of Care and Outcomes Research Interdisciplinary Working Group. J Am Dent Assoc. 2008 Jan. 139 Suppl:3S-24S. [Medline]. McElhinney DB, Sherwood MC, Keane JF, et al. Current management of severe congenital mitral stenosis: outcomes of transcatheter and surgical therapy in 108 infants and children. Circulation. 2005 Aug 2. 112(5):707-14. [Medline]. Kim MH, Cha KS, Kim JS, Hung JS, Lau KW. Successful inoue balloon mitral commissurotomy in double-orifice mitral stenosis. Catheter Cardiovasc Interv. 2000 Feb. 49(2):200-3. [Medline]. Mercer JL, Tubbs OS. Successful surgical management of double mitral valve with subaortic stenosis. J Thorac Cardiovasc Surg. 1974 Mar. 67(3):440-2. [Medline]. Yurdakul Y, Bilgic A, Saylam A, et al. Congenital double-orifice mitral valve. Report of a case with valve replacement. Jpn Heart J. 1980 Jul. 21(4):545-50. [Medline]. Tomita Y, Yasui H, Tominaga R. Mitral valve repair for isolated double-orifice mitral valve with torn chordae. Ann Thorac Surg. 1997 Dec. 64(6):1831-4. [Medline]. Matsuwaka R, Sakakibara T, Mitsuno M, et al. Valve repair for mitral regurgitation associated with isolated double-orifice mitral valve. J Thorac Cardiovasc Surg. 1996 Dec. 112(6):1666-7. [Medline]. Gorgulu S, Celik S, Eksik A, Tezel T. Double-orifice mitral valve associated with nonisolated left ventricular noncompaction--a case report. Angiology. 2004 Nov-Dec. 55(6):707-10. [Medline]. Bhamra-Ariza P, Muller DW. The MitraClip Experience and Future Percutaneous Mitral Valve Therapies. Heart Lung Circ. 2014 Jun 26. [Medline]. Kar S. Percutaneous transcatheter mitral valve repair: adding life to years. J Am Coll Cardiol. 2013 Sep 17. 62(12):1062-4. [Medline]. Two-dimensional echocardiogram (parasternal short-axis view) shows double-orifice mitral valve, the orifice being divided by a bridge of tissue. Two-dimensional echocardiogram of a double-orifice mitral valve (apical view) with color flow mapping, which shows diastolic flow through 2 separate orifices. Two-dimensional echocardiogram (parasternal short-axis view) in a patient with duplicate mitral valve. This diastolic frame shows two typical mitral valve orifices opening into the left ventricle. The two orifices are placed apart unlike the more common type of double-orifice mitral valve (see image above) where the orifice is divided by a bridge of tissue. Real-time two-dimensional echocardiogram (apical view) in a patient with duplicate mitral valve. Two mitral valves can be seen opening into the left ventricle. Each valve has a separate annulus, and a separate set of mitral valve leaflets and subvalvar apparatus. Real-time two-dimensional echocardiogram (subcostal short-axis view) in a patient with duplicate mitral valve showing two typical mitral valves opening into the left ventricle. The two orifices are placed apart unlike the more common type of double-orifice mitral valve (see image above) where the orifice is divided by a bridge of tissue. Disclosure: Received research grant from: Lundbeck Pharmaceuticals<br/>Received grant/research funds from Lundbeck Pharmaceuticals for none.